But how do these modern storms and cold spells compare to some of those in the past? Climate is notoriously variable and hard to summarize: “Climate is what we expect, weather is what we get.” – Mark Twain. However, there have been some exceptional winters in the past that make our recent winters look pretty mild indeed. Have you heard of The Little Ice Age? This was a period of relatively colder weather between about 1300 and 1870, with particularly cold spells beginning around 1650, another starting in 1770 and another beginning around 1850. Let’s take a look at each. 17th Century: The River Thames used to freeze over regularly, and between 1608 and 1814 Londoners held a Frost Fair on the frozen estuary. 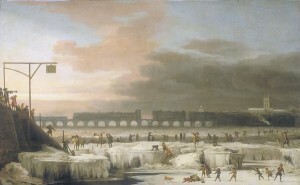 During the Great Frost of 1683-84, the river was frozen solid for two months. The Frost Fair of 1814 turned out to be the last one, as the winters became a little milder and changes in the river flow made it less likely to freeze. 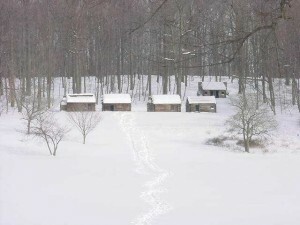 In North America, the severe, river-freezing winter of 1609-10 and a feud with the Powhatan Indians contributed to an 80% mortality rate among the settlers of the Jamestown Colony, a winter they called “The Starving Time”. Some colonists resorted to cannibalism to survive. Of the many accounts of fierce storms and blizzards during the latter half of the 19th Century the deadly storms of 1888 stand out. 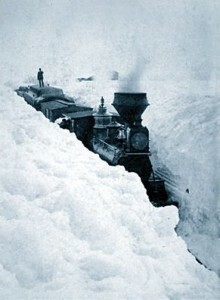 In the West, January 12, 1888 saw the Children’s Blizzard of 1888. It’s called the Children’s Blizzard because it ambushed so many rural children walking home from school, and as many as 400 people died. Two months later, from March 10 to 13, 1888 the Great White Hurricane hit the East Coast, where another 400 people died amid cold temperatures around 6 °F and high winds up to 80 MPH which drifted the snow to 52 feet in places. New York was paralyzed with the snow drifts, and people unaccustomed to the dangers of going outdoors in blizzard conditions became lost and froze to death. 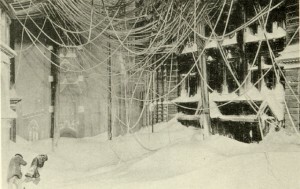 The web of overhead electrical and telephone wires presented an unexpected new hazard when the wind and the weight of the snow brought many of them down. Vox’s Take: It’s a little hard to compare the severity of a winter 123 years ago with one today, since we have so much better technology now to deal with the cold and snow. I can go from my centrally-heated house to my heated four-wheel-drive truck to my heated office building in relative comfort – not exactly like having to hitch the team to the sleigh in the blowing snow. However, the historical record gives credence to the idea that winters really used to be harder, (how many times recently have we heard of New York Harbor freezing over, or 52-foot snow drifts?) and all the more so given people’s ability to cope with them.